DENVER, CO--(Marketwired - Jun 10, 2015) - Cloud Elements, a cloud API management and integration service, today announced the first data mapping and transformation service available completely through REST APIs. Element Mapper is the only mapping tool built by and for developers. It saves time, as well as costs associated with building, normalizing, mapping and transforming data between cloud service endpoints. Element Mapper gives developers the option to easily embed a user interface (UI) into their application for simplified, drag-and-drop mapping. Alternative data mapping approaches require individual point-to-point integrations between every data object, at every endpoint, quickly leading to a complex spider-web of mappings that are difficult to support and maintain. Element Mapper's "one-to-many" data model, allows developers to define one canonical data structure that works with many endpoints. Cloud Elements' customer Influitive, advocate marketing expert, was an early beta user of Element Mapper. Influitive was finding a growing number of requests for integrations to the CRM or marketing automation systems their customers already used. The influx of integration requests combined with Influitive's own product development priorities became a burden on the development team. "It was awesome being an integral part of the [Element Mapper] design process with the Cloud Elements development team," said Aaron Rothschild, director of product management, Influitive. Essentially Rothschild's team uses the Cloud Elements APIs for data transformations, which are then wrapped up by Influitive's embedded data mapping UI. "It took us almost a month or more to create the initial integration to a marketing automation platform on our own. With Cloud Elements, we were moving ten times faster and released three new integrations in just under two weeks," continued Rothschild. "We're the first API built for the world of 'many' -- many APIs, with many unique data structures that all need to work together within many integrations," said Mark Geene, CEO and co-founder, Cloud Elements. "Our new mapper API makes it easy for developers to programmatically move data between endpoints. With the launch of Element Mapper, we are delivering the latest in a series of innovations that make API integration easier and more elegant." 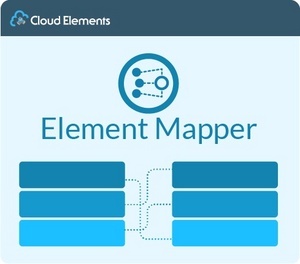 Element Mapper works with all of the integrations available in the Cloud Elements CRM, Marketing, Finance, Ecommerce, Help Desk and Human Capital Hubs. To find out more about Element Mapper visit http://cloud-elements.com/element-mapper/. Cloud Elements is a cloud API management and integration service that enables developers to publish, integrate, aggregate and manage all of their APIs through a unified platform. Using Cloud Elements, developers can quickly connect entire categories of cloud services (e.g., CRM, Documents, Finance) using uniform APIs or simply synchronize data between multiple cloud services (e.g. Salesforce, Zendesk and Quickbooks) using its innovative integration toolkit. Cloud Elements is headquartered in Denver, CO, but serves customers worldwide. More information about Cloud Elements can be found at www.cloud-elements.com. Element Mapper's "one-to-many" data model, allows developers to define one canonical data structure that works with many endpoints.